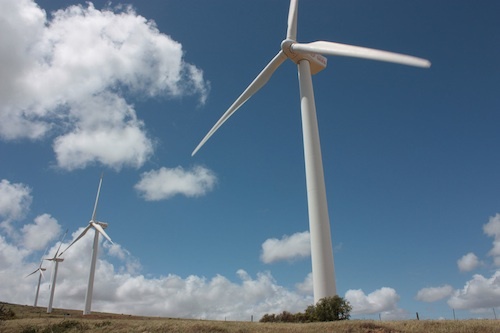 Although the country’s first ‘wind farm’ in Darling on the west coast began generating electricity in 2008, about 90% of this energy, which is purchased by the City of Cape Town, has not been sold on. While the wind-generated electricity from the Darling Wind Farm feeds into the Eskom electricity grid and is purchased by the City of Cape Town in accordance with a 20-year agreement, the City sells the wind-generated electricity in the form of Green Energy Certificates (GECs) to business who are looking to “green” their electricity for a small premium. However, the City has sold so few of these certificates that they are building up enough green energy stock to power over 2000 households for a year, and yet doing very little to market the availability of these certificates. The Darling Wind Farm (DWF), situated 70km north of Cape Town, was South Africa’s first commercial wind farm and produces 6-8 GigaWatt hours (GWh) of energy a year. Since May 2008 the DWF has generated about 30.8GWh of electricity, of which only 1.8GWh have been sold, according to Mayoral Committee Member for Utility Services in Cape Town, Ernest Sonnenberg, leaving the City with a stock of roughly 29GWh. According to Sonnenberg there is only “one monthly purchaser and otherwise one or two ad hoc purchases a month”. The certificates have been on sale since the end of 2009 but the City has advertised on only four occasions in local media with limited response. Otherwise information is only available on the City’s website. “In order to contain marketing and administration costs, the City would prefer to sell larger quantities of GECs to fewer customers,” said Sonnenberg. Nicholas Rolland, Director of G7 Renewable Energies, said the City is trying to centralise their accounting burden. The Darling Wind Farm entered into a 20-year contract with the City selling electricity for a fixed rate. They may soon go into negotiations to raise that rate however, as they currently receive lower than industry prices for their electricity. G7 Energies currently has plans for many more wind farms that are all tender ready. So we need 2500 Darling Wind Farms to produce the electricity Koeberg does. And those wind farms would have to have back-up plant spinning unproductively on the grid (assuming they are allowed to be on the grid – not a good idea. Correction : his name is Nicolas Rolland not Nicholas Rolland ! Oelsner Group (PTY) LTD. has moved to Farm Langefontein a former military radio station were we develop a 51 MW wind farm, a 5 MW PV electricity generation plant and a national and international research facility for renewable energy technology. You are very welcome to visit us – bring your camera and you will find something really interesting to write about.